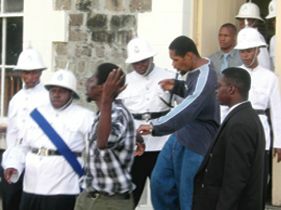 No signs of emotion or remorse dawned upon the faces of convicted murderers Shorn George and Earlando Lampkin when Justice Gertel Thom slapped a life sentence on them for bludgeoning to death police constable Elson ‘Raca’ Richardson. A third man, Earl Jack, 19, who pled guilty to manslaughter in November 24, 2005, was sentenced to five years after he admitted being the driver of the vehicle. The night of the murder both Lampkin 23, at the time, and George 21, journeyed from their home at Great House, Lowmans to Club Iguana in Calliaqua where they were breaking into cars parked outside. The police officer was sitting in one of the cars which Lampkin approached with a gun drawn. Lampkin and George beat the policeman, threw him into the trunk of the car and drove it to Rabbbaca Dry River where they could not venture further because of stones in the road. While in the car, Lampkin found Richardson’s police identification card and said “Yo dead tonight”. Reports are that Richardson was crying for his life and told them to take the vehicle and leave him as he had a family to take care of but his cries fell on deaf ears. They drove the vehicle to a place called Belle View where Richardson was taken out of the trunk and placed on the ground and told to lay face down. At this time George did the unthinkable, he picked up a big stone and crushed Richardson’s head while Orlando placed his foot on his back. Not satisfied enough, George slammed the stone on his head twice more. He was then rolled over an embankment. The stolen car was driven to Chauncey where they burnt it. Acting Director of Public Prosecutions (DPP) Colin Williams sought the death penalty. He said the murder was committed in pursuance of another offence of armed robbery, it was a murder of a possible witness to the said offence, the deceased was killed because he was a member of the Security Services and that the case did not meet the worse case scenario. Earlier in the trial, defense lawyer for George, Kay Bacchus-Browne said there was some hope of reform for her client. She cited the report of the psychologist who examined George which said that George showed no signs of being reformed “at this time”. Bacchus-Browne submitted that the optional words were “at time” which inferred there was hope for the future.